In our last Nature paper, we create metamaterials that achieve complex shape-changes without external control! In our last Nature Physics paper, we uncover a characteristic lengthscale that governs the mechanics of metamaterials and give new opportunities for their programmability! In a new paper, we uncover a novel facet of the Leidenfrost effect, where water evaporation couples to elastic deformations. Hydrogel balls bounce persistently ! In our new paper published in JMPS, we develop a theory for wide beams made of nonlinear elastic materials! We unveil static non-reciprocity using mechanical metamaterials! They can transmit static motion in one way and block it in the other! Click here for the paper. 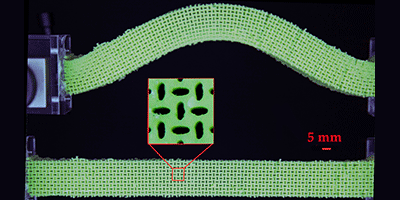 We investigate mechanical metamaterials that exhibit auxetic and highly nonlinear properties! The paper can be found at this link. We can control the buckling instability by rationally designing a nonlinear metamaterial! Download our article here and see this link for a Synopsis highlight article written by Katherine Wright. See also our explanatory movie below! Local inflation probes isotropic shear and reveal non linearities close to jamming in 2D packings! Download our article here and see this link for a highlighting Viewpoint article written by Karen Daniels.